We researched several different types of tow hitches available and based on that research, have chosen the CURT 13105 Class 3 Trailer Hitch as our best overall pick. In addition to the best overall pick we have reviewed two additional top rated tow hitches for you to consider. There is also an informative buying guide that will provide you with all the knowledge you need about tow hitches to sort through the different brands and make a decision based on your specific needs and preferences. The right information will ensure that you don’t waste your money on the wrong tow hitch. A tow hitch offers a safe way to haul a trailer. Some people use a ball that is attached to your vehicle’s bumper but this method can only handle a limited amount of weight and offers no height adjustments. Installing a hitch to the bumper of your vehicle allows you to adjust the ball height and tow heavier loads much easier. There are many different classes of tow hitches on the market. Which class you choose depends on the weight that you will be towing. There are other reasons for getting a hitch rather than just a ball mount and we will go over these reasons in the buying guide that is at the end of this article. There are several situations where a tow hitch would be very beneficial. These include pulling a boat, pulling a trailer in a parade, towing a trailer during a move, and transporting horses. Choosing the right tow hitch is dependent upon knowing what you need it for and ensuring that you choose the right tow hitch for that particular kind of towing job. It is also important to get the right tow hitch for your vehicle type. There are several additional factors that you will need to take into consideration when you are researching tow hitches. With the different brands and different classes of tow hitches available, it can be very confusing to choose one especially if you have never towed anything before. This buying guide will help you compare the different towing hitches available, understand the different classes, learn about the different types of hitches and how to choose the right one. With the right towing hitch on your vehicle, you will be able to tow many different things safely and without worry. The most commonly installed tow hitch is the CURT class 3 hitch. It is typically installed on full size pickups and SUVs. You can also find it on crossover SUVs, mid-sized trucks, and even some full-sized cars. The class 3 tow hitch provides the towing power of a heavyweight tow hitch but is still lightweight enough to install it on a variety of vehicles. The trailer weight capacity of the class 3 tow hitch from CURT is 3500 pounds and has a tongue weight of 350 pounds. The 2 x 2 receiver opening is a tube shape that can accept hitch mounted accessories including cargo carriers and bike racks. It can also handle a ball mount that can tow single horse trailers, trailers for boats and large campers, and utility trailers. The class 3 is also compatible with a hitch that offers weight distribution, something the class 1 and 2 do not offer. When the CURT class 3 is used with a weight distribution hitch the weight capacity goes up to 5000 pounds and the tongue weight capacity increases to 500 pounds. This steel frame hitch has been welded for exceptional, reliable strength and precise fit. It is 9 ½ inches off the ground when installed. The round tube body of the receiver is coated in a long lasting, durable black powder finish that is high-gloss that is rust resistant as well as scratch resistant and resists UV damage as well. There is a lifetime limited warranty on this product and a 1 year finish warranty. 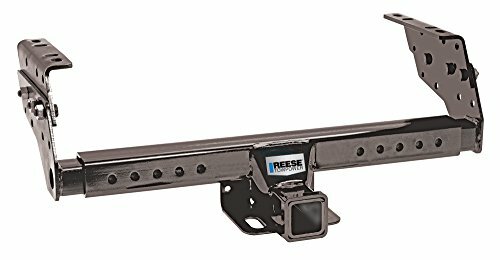 The Reese Towpower’s class 3, multi-fit receiver hitch is designed for as much as 5000 pounds of gross towing weight and 500 pounds of tongue weight. Be sure to check your vehicle’s manual to see what the maximum towing capacity is. This tow hitch can be installed in as little as 45 minutes. The hitch is made with heavy-duty all welded construction for the ultimate in safety and strength. You may have to do some drilling to install on some vehicles properly. Every Reese tow hitch has been extensively tested to deliver the highest quality tow hitch available. The hitch is coated with METALSHIELD, a three step finishing process that makes it rust and scratch resistant. This coating process offers the best corrosion protection possible and is head and shoulders above other brands that only use powder coating on their hitches. This easy-to-install tow hitch will make towing almost anything easy and safe too. If you are looking for a reliable, strong tow hitch, DRAW TITE class 3 tow hitch is what you need. This hitch has been designed to work perfectly with SUVs, trucks, and vans and can be attached directly to the vehicle’s frame without any drilling. The solid welded construction provides excellent durability and strength. The towing capacity is 4500 pounds with a tongue weight of 675 pounds. Don’t forget to check your vehicle’s towing capacity in the owner’s manual before towing anything. The tow hitch is coated with an A-coat base and black powder coating that is resistant to corrosion, rust, scratches and extreme weather conditions. The design of this tow hitch has been fatigue stress tested for top performance and fit that will last for decades with proper care and use. The 2” square receiver opening is standard and works with many ball mounts. The Draw Tite tow hitch comes with a lifetime limited warranty. High quality tow hitches make towing trailers much easier and safer. Towing trailers can be dangerous with the wrong hitches, bad installs, or low quality construction. To ensure the safest towing experience possible it is necessary to start with a high quality tow hitch. There is a lot to know about tow hitches to ensure the safest towing experience possible. Classes, weight capacities, and how they are mounted is just the tip of the iceberg. With many choices on the market to sort through you will need to know some important things about tow hitches to ensure you choose the right one for your vehicle and the towing jobs you need done. We spent time researching the many different tow hitches we found and looked at their construction, coating, receiver style, weight capacities, and brand reputation of the manufacturers to save you the headache of trying to figure that out on your own. 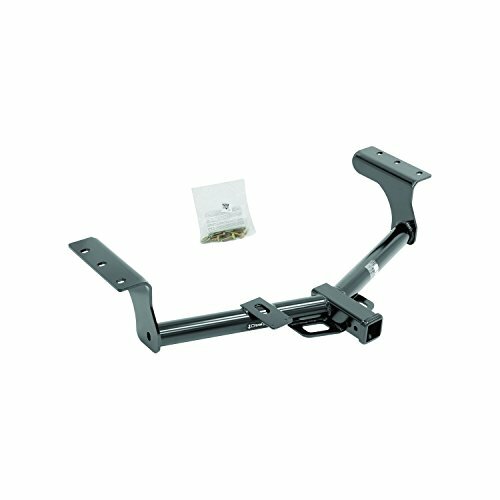 The three top-rated tow hitches we have reviewed above are all high quality hitches that have superior welded construction, excellent brand reputation, and have high weight capacities that can take care of most towing needs. Both of the companies that we have featured have several tow hitches to choose from in different classes. There are several hitch words and terms that you will encounter in your search for the right tow hitch. Knowing what these words mean will help you understand what you are reading so you know whether the hitches you are looking at will work for your needs. We have listed these common terms below. Ball Mount – The part of the trailer that connects the vehicle to the trailer. This is the part of the trailer that is lowered onto the ball that is attached to the vehicle. Gooseneck Hitch – A gooseneck hitch is not the same thing as a ball hitch due to the fact that the trailer is mounted to the center of the truck bed rather than the bumper. Ball – The ball of a tow hitch assembly is the solid sphere-shaped piece that is on the vehicle hitch. The ball allows the trailer to pivot safely and allows it to adjust to corners and uneven road conditions without getting jarred. This is especially important when you are transporting animals. Tongue Weight – Tongue weight or TW is the amount of force downward that the tongue can handle without problems. Tow hitches typically list two weights: towing capacity and tongue weight. Gross Trailer Weight – The total weight that the hitch can handle when the trailer is fully loaded with what you will be towing is referred to as the gross trailer weight. Pin Weight – This is the total weight that is sitting on the pin. The pin holds the towing assembly together. Hitch Pin – The steel bar that is put into the draw bar, holding everything together is known as the hitch pin. Weight Distribution – When you load is distributed properly, towing becomes much safer and more stable. There are several things you need to know and have in place before you purchase a tow hitch. This information will ensure that you choose the right hitch for your vehicle and the tow jobs at hand. Budget – There are several types of hitches on the market with a variety of price points. It is important for you to decide what you are looking to spend on a tow hitch before you start shopping around. Setting a budget and sticking to it will provide you with the best shopping experience and will help you avoid spending more money than you anticipated. Even if the tow hitch you are interested in is too much, there are options that can help you save money on that model if you look around and comparison shop. Tow Hitch Quality – The quality of the tow hitch you purchase can determine its lifespan and performance. Purchasing the cheapest one you can find is a recipe for disaster. There are manufacturers that are reputable and that regularly produce high quality products that you can trust and there are others that it would be better to avoid. The majority of tow hitches are made from pieces of steel that have been welded. The strength and quality of those welds and the coating that is applied to the hitch, if any, will provide added strength and protection against wear and rust. Check out the reputation of the different hitch companies you find. Look for strong warranties and excellent product reviews from others who have purchased the hitch and used it. These are points that will help you have a great chance of choosing a tow hitch that will perform at the highest standard and that will last as well. Make and Model of the tow vehicle – They manufacturer, model, and year your vehicle was made is very important information to have to ensure you purchase the right tow hitch. Some designs on the market will not work with certain vehicles so having this information will point you in the right direction when it comes to eliminating the hitches that won’t work with your vehicle. Your vehicle’s towing capacity – It is important to find out the towing capacity of the vehicle you will be using for your towing jobs. This information is different for each vehicle and can be found in the vehicle’s owner’s manual. Do not deviate from this number to avoid damage to the vehicle. Gross trailer weight – The next step is to know what the gross weight is of the trailer you’ll be towing. Gross weight refers to the weight of the trailer when it is loaded with the cargo you are towing. Included in the gross weight are safety equipment if applicable and other supplies that may be in the trailer as well during transport. Determine the highest weight capacity you can tow – To figure out the max weight capacity you should tow is in direct relation to the lowest-rated towing component. For example, let’s say your vehicle has a towing capacity of 10,000 pounds. If you hitch is rated for 5,000 pounds then your total tow rating drops to 5,000 pounds. To not have low limits, look for towing components that have ratings higher than you think you’ll need so you will not be above the towing capacity rating. Choose the right ball mount – After you have chosen a hitch for your vehicle, look for a ball mount that matches it and has the correct rise or drop to ensure the trailer you are towing will be level. Choose the right trailer ball – Look for a trailer ball that fits the coupler of the trailer. There are 4 basic types of tow hitches on the market. We have listed each type below along with characteristics of each. 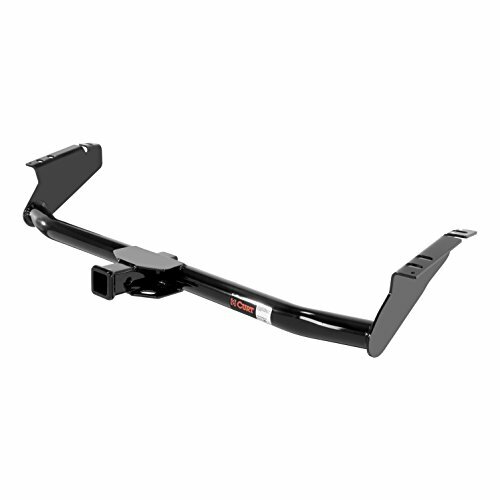 Bumper Frame Hitch – This is the simplest type of hitch but not the best one to purchase. With this style, the ball is attached to the bumper of your vehicle. There is little strength in this type of tow hitch and using it for towing anything that has some weight to it can result in problems. Ball Hitch – The most common type of hitch for pick-up trucks and SUVS is the ball hitch. The design of this type of hitch includes a metal steel ball that is attached to the tow bar of your vehicle. There are several different sizes of balls to choose from depending on the size and weight of the load you are towing. Make sure that the ball you choose matches the socket of the trailer. This type of hitch involves a receiver that is attached to the vehicle. The receiver is the part that the ball mounts and trailer part slides into when putting the whole assembly together for towing. There are 4 classes of tow hitch available that are determined by the towing and tongue weight. Gooseneck Hitch – A gooseneck hitch is designed to attach to the bed of your pickup rather than the back. It is much stronger and capable of towing large loads like horses trailers. Some gooseneck hitches can be removed when not in use while other designs are underneath the bed of the towing truck and can be covered up when not in use. A gooseneck hitch is capable of towing much larger trailers. Fifth Wheel Hitch – This is the strongest type of hitch on the market. It can be used on large trucks and is a permanent hitch that has been mounted onto the bed of the truck via a steel plate. This type of hitch is for regular, heavy duty towing. When installing a fifth wheel hitch a sidewinder or slider can be installed along with it to prevent the trailer from striking the cab of the truck if it makes a sharp turn. There are five different classes of towing hitches available. Each class is separated by towing weight and tongue weight capacities. We have listed each class below and provided some information on the types of vehicles they are best suited for as well as the weight capacities of each class. Class 1 – The class 1 hitch is for light-duty and is usually installed on small SUVs and passenger cars. There opening is 1 ¼” and have a gross trailer weight rating of 2000 pounds with a 200 pound tongue weight. This is a good choice for towing small utility trailers, boats, and motorcycles. Class 2 – This hitch class is usually installed on small trucks, minivans, and mid-sized sedan vehicles. The opening is 1 ¼” x 1 ¼” and have a tongue weight of 350 pounds with a 3500 gross trailer weight. This moderate duty hitch can handle snowmobiles, mid-sized boats, and small campers. Class 3 – The gross trailer weight of this class hitch ranges from 3500 pounds to 6000 pounds and it features a tongue weight that ranges from 350 pounds to 600 pounds. The receiver opening on the class 3 hitch measures 2” x 2”. Class 3 hitches can be installed on minivans, full-sized SUVs, and pickup trucks and are perfect for medium sized campers, medium sized boats, and utility trailers. Class 4 – The heavy-duty class 4 hitch is for large SUVs and heavy duty pickup trucks. The tongue weight ranges from 600 pounds to 1000 pounds and the gross trailer weight can range from 6000 pounds to 10,000 pounds. Class 4 hitches have a receiver opening of 2” x 2”. A class 4 hitch is most commonly used for towing large boats and campers as well as being used for toy haulers. Class 5 – The biggest of all the classes, this class 5 hitch can be installed on commercial and heavy duty trucks. They have a 2 ½” x 2 ½” receiver opening and have a gross trailer weight of 10,000 pounds or more. The tongue weight of the class 5 hitch ranges from 1000 pounds to 1200 pounds. If you are towing large boats, multi-horse trailers, equipment trailers or full-sized campers, the class 5 is what you are looking for. When doing any kind of towing, small or large, keep these safety tips in mind. Check the tire pressure on both the trailer tires and the tires on your tow vehicle to make sure they are at the proper inflation level. Make adjustments as necessary. Check all of the towing assembly including the coupler, hitch, safety chains, ball mount and anything else that is a part of the towing assembly before pulling out to make sure that the vehicle and trailer are secured properly. Check to be sure the wiring is connected the way it should be. You want it to be loose enough to handle any turns you have to make without becoming disconnected or damaging the wires by being too tight. Do not let the wiring touch the road. Trailers much have turn signals, hazard lights, running lights, and brake lights. Check all of these to ensure they are properly connected and working the way they should be. Check the brake fluid on the tow vehicle and the brakes to make sure they are in proper working order as well. If the trailer has brakes, make sure they are operating correctly as well. Is everything you are towing properly secured and tied down? You don’t want things sliding around or shifting while you are in transit. Use proper tie downs and check a couple of times before hitting the road that they are tight and secure. Make sure that the tongue support, stabilizers, and trailer jack are raised and locked into the proper position. This is also when you should check to make sure that everything is balanced correctly from the front of the vehicle to the back of the trailer and side to side as well. Ensure you have good visibility by checking rear-view and side mirrors so you can see all around the vehicle and trailer properly when you are on the road. Know your restrictions, if any, on the route you are taking and check your route ahead of time especially if you will be making stops along the way. You will need jack stands and chocks for when you reach the destination to secure the trailer and vehicle while you are unloading. There are many reasons you may need a tow hitch from towing trailers to campers and boats. Whatever your towing needs are, the most important thing is to make sure you have chosen the right class and the right hitch for the job. Towing can be relatively simple if you have done your homework ahead of time and understand all that you have to do to choose the right hitch for your vehicle and towing job. The purpose of this guide is to provide you with all the information you need to determine the class you need, the kind of tow hitch that will work the best with your vehicle, the weight restrictions you have and other factors. The three top-rated tow hitches we have featured in the reviews above are all excellent choices that will work for a variety of towing needs. If you are interested in one of them, check to make sure your vehicle can handle the weight ratings of the hitch you are interested in purchasing and then follow all of the instructions and safety tips we have provided to secure the trailer and your load. It is important that you are educated on tow hitches and that you don’t exceed the weight limits even a little bit. It is much safer to choose a hitch that is less than your gross trailer weight and tongue weight restrictions rather than pushing it to the limit. Before you spend your money on a tow hitch, make sure you have all the information you need to choose the right one such as vehicle towing capacity, the type of towing jobs you will be doing, and roughly how much the trailer will weigh when fully loaded. Following these steps will reduce the chances of anything going wrong and will provide you with a safe, strong tow hitch that will last for years.